If you long for a child this holiday season, know that you aren’t alone. The holidays can be particularly challenging because they remind us of family and traditions are often centered around children. For my husband and myself, we struggled each winter, having seen it as another year gone by. Each change of the calendar became another reminder of our failure to have a baby. Thankfully, for us the New Year represented hope again – 12 full months to try again with the goal of success. We know, from personal experience, that the road to infertility can be a challenging one, and we are here to help support you as you pursue your dream of parenthood. With a fresh year around the corner, it’s a good time to consider new possibilities to grow your family in the next year. Many couples consider donor egg after experiencing multiple unsuccessful IVF cycles, repeat miscarriages, or learning that their eggs are no longer viable. While not everyone will be successful using donor eggs, the vast majority will get pregnant with a baby within one year of trying. Frozen donor egg has successfully helped hundreds of families overcome these difficult infertility diagnoses to have children. We believe so strongly in donor egg as an effective family building option that we offer a money back guarantee. Our large national donor database of proven successful donors may have the perfect match for your family. Don’t let another holiday pass by without considering new options in your parenthood journey. If you haven’t been successful and are currently in treatment, then I encourage you to persevere. Yes, it is hard, but do your best to see the opportunity that a New Year will bring. The journey of a thousand miles begins with a single step. If you don’t move forward, you will never achieve your goal. 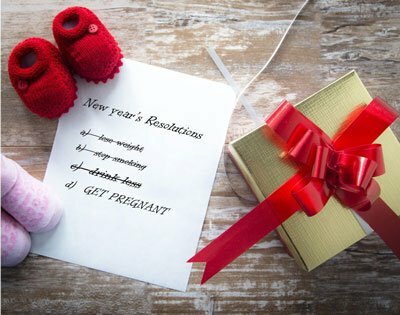 Let us help support you in reaching your goal of building a family this year. We wish you a Happy Holiday season and best wishes for the New Year!